Hi. Our updates are less frequent – but there are loads of details that don’t seem worthy. Today is different. Our friend Matthew Kroeker has been coming down from Onanole, three days here, two there, etc. 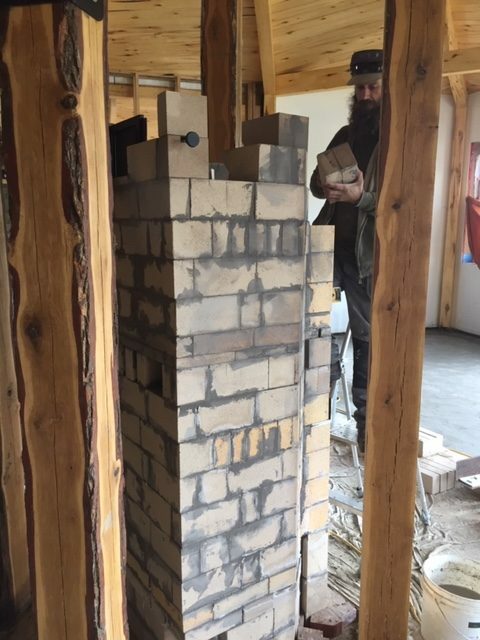 to work on our masonry heater. We’ve been eager to have him around. Winter was threatening. And now it’s working for us. We’ve been using it for a couple weeks – and as of today we’ve even eaten from it. In this photo Matthew is building the inside core out of fire brick. This core has one direct channel to allow for a strong upward draft, used when lighting a fire and then closed off. 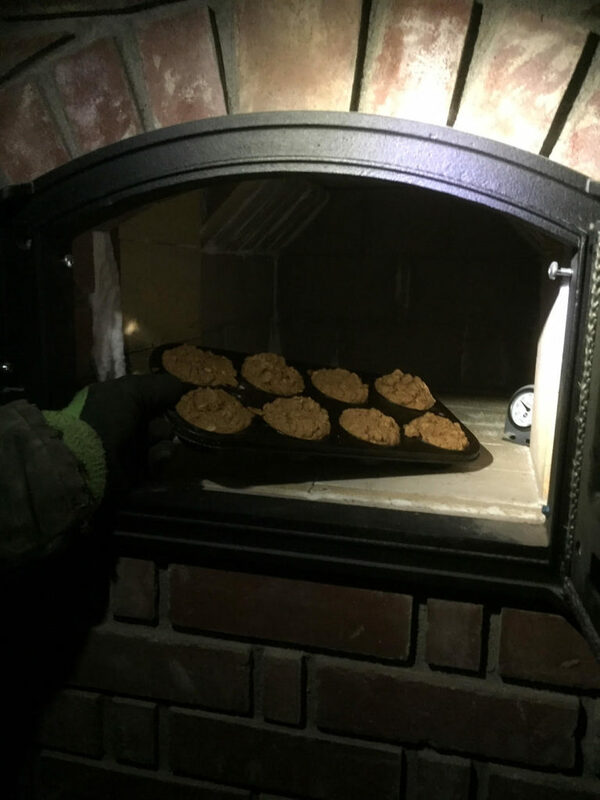 The core also has several channels that force hot air to be drawn throughout the mass of the stove so as to ensure as much of the heat from the fire is absorbed as possible before the air is taken out of the house by the stove pipe. 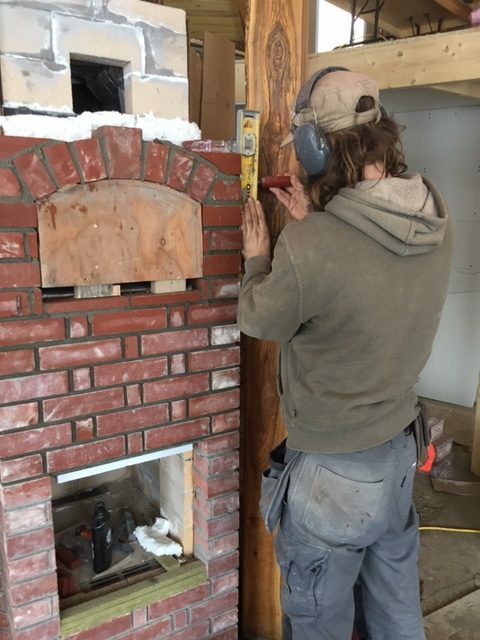 Here Matthew is putting the outside brick face on the heater. We got this red brick from an abandoned farm house near Ninga. Maggie spent countless hours grinding off the old mortar leaving just enough white blush on the bricks to give them a pleasant aged look. The lower hole is where the fire is made. The upper, covered in plywood at this stage, is the bake oven. You can see how Matthew designed the stove to go around and compliment the four hard wood posts holding up the centre of the roof. 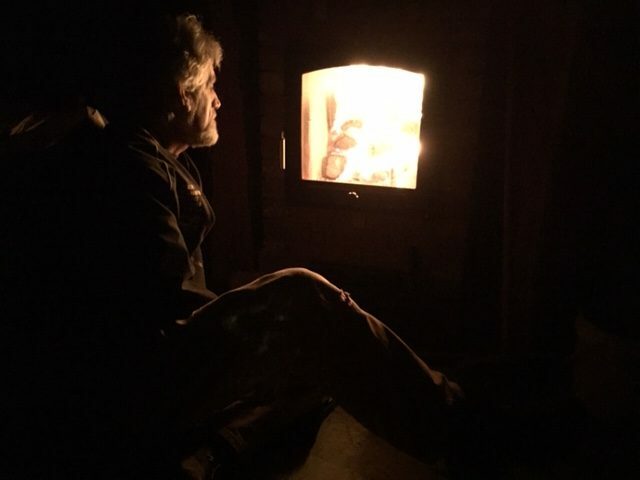 Hunter, our Grandson, joined us to help light and enjoy the first fire. We put on a few small fires at random times to slowly cure the mortar before beginning with the large, fast fires that are the trade mark of these stoves. When we started putting on two large fires a day (morning and evening), the house was at about 10 degrees Celsius. 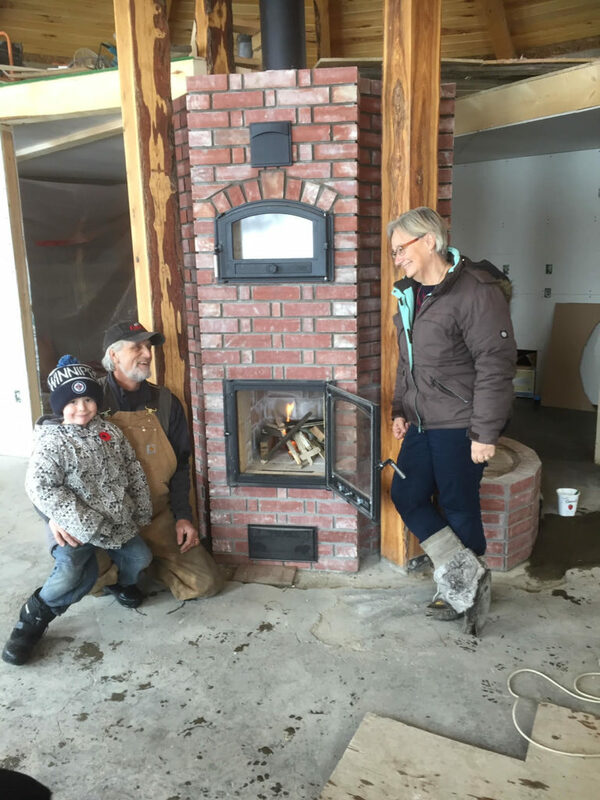 Not only were we building the core temperature of the heater, but we were also slowly warming the thermal mass of the house – the earthen floor and back wall. We noticed that, even though we haven’t had much help from the sun these days (5 weeks and counting with only two sunny days) the core temperature of the house has been going up about 1/2 a degree a day. We’re now sitting at a very comfortable 18 degrees. Maggie had to throw in this shot of the fire. We were hanging out in the house last night waiting for the oven to do its work. Better than television. Yay! Apple spice muffins. Thank-you Matthew. And thank-you Tusa and family all for giving up your husband and your father for this project. When are we moving in? December 22 and 23. We’ve rented out the Guesthouse over New Years and so we have to get out. It may be more like camping those first few weeks, but all the essentials should be working by then. You’re welcome to drop in.